Happy Holidays from your neighborhood Einstein Bros! We have so many specials and deals this holiday season to share with you, so let’s just get started! First, Mondays get more merry – $6 Mondays mean 13 bagels for only $6! Be sure to call your orders in (CB 951-1515, F 675-6667) so you can get all your favorite flavors! Second, have you gotten a cherry cup of Winter Blend Coffee yet? Grab one of our holiday cups, specially designed by J. Gerhardt, or how about a brand new metal travel mug as part of a Coffee Gift Pack, along with a bag of our Cinnamon Winter Blend? Fido deserves a treat too! Grab a cute pack of Doggie Bagels – 5 for $4.99! Of course, don’t forget about gift cards – the easy way to give your friends and family the gift of bagels and coffee! We hope you enjoy all the wonderful gifts of the season we have to offer at your neighborhood Einstein Bros Bagel. See you soon! Come Celebrate our Month of Thanks! Throughout the month of November, we’ll be giving thanks every week to important people in our world and in our lives, starting with our armed forces on Veterans Day and ending with a surprise deal for you, our loyal customers, on Thanksgiving weekend! So be sure to share these special offers with the veterans, police officers and educators you know and, as always, follow us on Facebook for all the latest events and special deals! 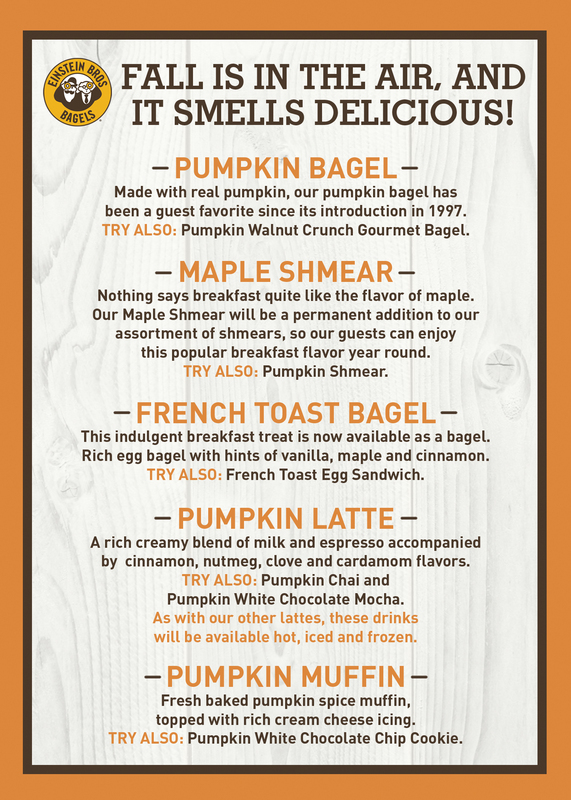 Fall has come to Einstein Bros. Bagels and with it, some old favorites and some new treats. But which is YOUR favorite? Please vote on our Facebook page for your favorite bagel. 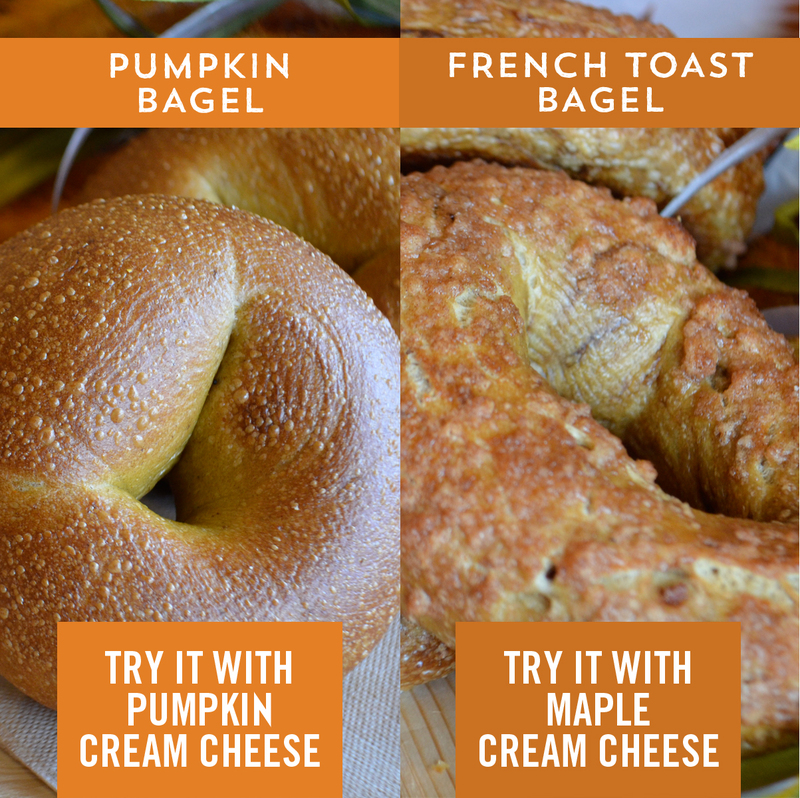 Will it be the guest favorite Pumpkin Bagel, made with real pumpkin since its introduction in 1997, or the delicious new French Toast Bagel, an egg bagel with hints of vanilla, maple and cinnamon? Share the photo on Facebook with your friends with the tagline #forthosewhocravefall, and the winning bagel will be FREE the last week of October. Attention Cedar Bluff patrons – have you noticed our new screen at checkout? Gone are the days of searching your wallet for loyalty cards – our NEW loyalty program is as easy as typing in your phone number! You get a point for each dollar you spend, which you can redeem for bagels, coffee and more! For more info, ask any of our Cedar Bluff crew, and Farragut customers – look forward to this exciting new program in your store by the end of this year. For those who crave fall and have been waiting all year long, pumpkin is coming this week! Get ready to enjoy old favorites like our Pumpkin Bagel and Shmear, and welcome new fall additions to both food and drink! Pumpkin will arrive Wednesday, but it won’t be here forever, so be sure to stop by for a taste of fall. As a special treat to our readers, here is a sneak peak at our new fall menu! We hope you are as excited as we are for the return of pumpkin, and hope to see you in-store soon to try old favorites and new treats! Five Year Anniversary Celebration – Win In-Store and Online! Five years ago, Jon and Yvonne Kidder opened their first Einstein Bros. Bagels on the corner of Cedar Bluff and Middlebrook. This weekend, come celebrate our Five Year Anniversary at BOTH of our locations July 10-14, and win prizes in-store and online! In-store, we’ll have a daily drawing. Write your name and email address on your receipt from that day and drop it in our Birthday Bagel Box. Every morning, we’ll announce five winners, who will receive $5 off their next purchase or, the grand prize, a Birthday Box Surprise, filled with free food and swag galore! We’ll also be giving away free cookies and brownies all day to a few lucky customers! Online, we’re hosting another Photo Fan contest, this time to celebrate our #kidseatfree summer! Send a picture of your kids enjoying their FREE dinner at our Farragut store, M-F, 6-8 PM to our Facebook page, and they could win their own prize pack! We’ll be announcing winners all summer long, but if you submit your photos during our Five Year Anniversary Celebration, you’ll receive a coupon for a Free Drink on your next visit! Check out our previous blog post for all the details. 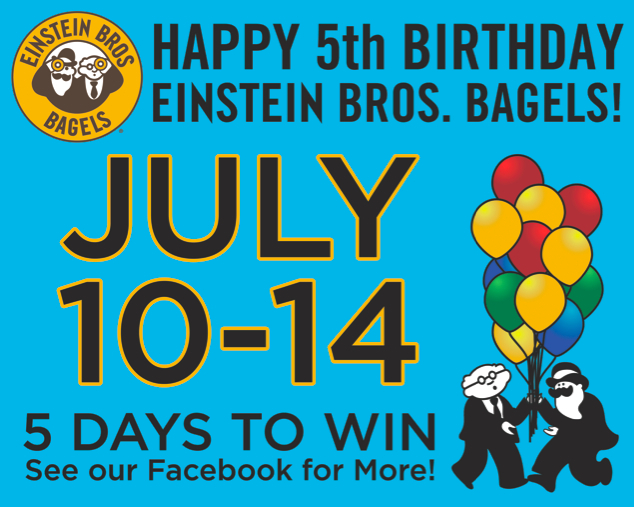 We can’t wait to celebrate with you, so be sure to stop by to grab your favorite bagel, and win some fabulous prizes every day of our Five Year Anniversary Celebration! #Kidseatfree this Summer at Einstein Bros! This summer at Einstein Bros. Bagels, Kids Eat FREE! Stop by our Farragut location (11693 Parkside Dr.) any weeknight from 5-8 PM, and your child will get their choice of pizza bagel, bagel dog, PB&J or grilled cheese FREE with the purchase of your meal. It’s Photo Fan Contest time again! Send us a private message on our Facebook page of your kids enjoying their FREE kids meals this summer, and they’ll be eligible to win a Prize Pack! Details: You may submit as many different photos as you’d like, but they must be family-friendly and feature your kids and our food, or they will not be considered. The more pictures you submit, the greater chance you have of winning. At the end of each month, we’ll post a maximum of ten images chosen from all submissions that month that we think shows the best Einstein Bros. Bagels #kidseatfree Photo Fan. We’ll then have you, the customers, vote for your favorite, and the winner of the most votes will receive a backpack filled with swag and a “credit card” good for ten FREE kids meals through the year’s end. This contest will occur three times (June 30, July 31 and August 31). You can submit as many pictures as you’d like each month, but your kid can only win one Prize Pack the whole summer. Start smiling and snapping, because #kidseatfree until summer ends! Topper Tasting Extravaganza This Week! Wednesday, June 10 – Breathe Fire with the Spicy Devil! Thursday, June 11 – Go Ape over the Nutty Monkey! Friday, June 12 – Try some Healthy Grazing with The Herbivore! Saturday, June 13 – Be Sweetly Satisfied with Berry Goodness! And remember, all four flavors will be available to sample on Tuesday, June 9 from 8AM – 2PM, so be sure to stop by this week. 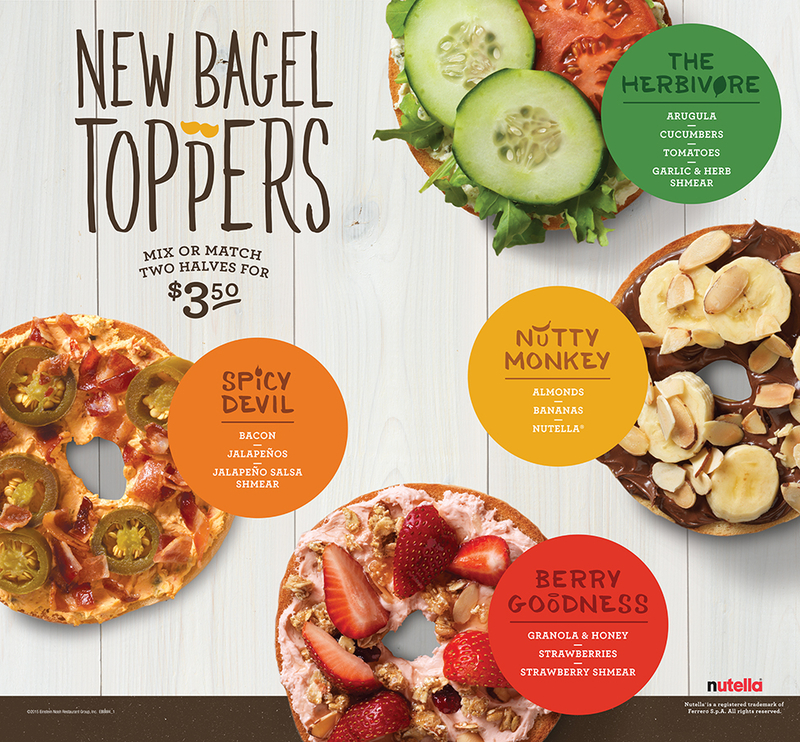 Whether you’re craving something sweet or savory, our new Bagel Toppers will leave you satisfied! Rate Us on Facebook and Get Ready for Toppers! 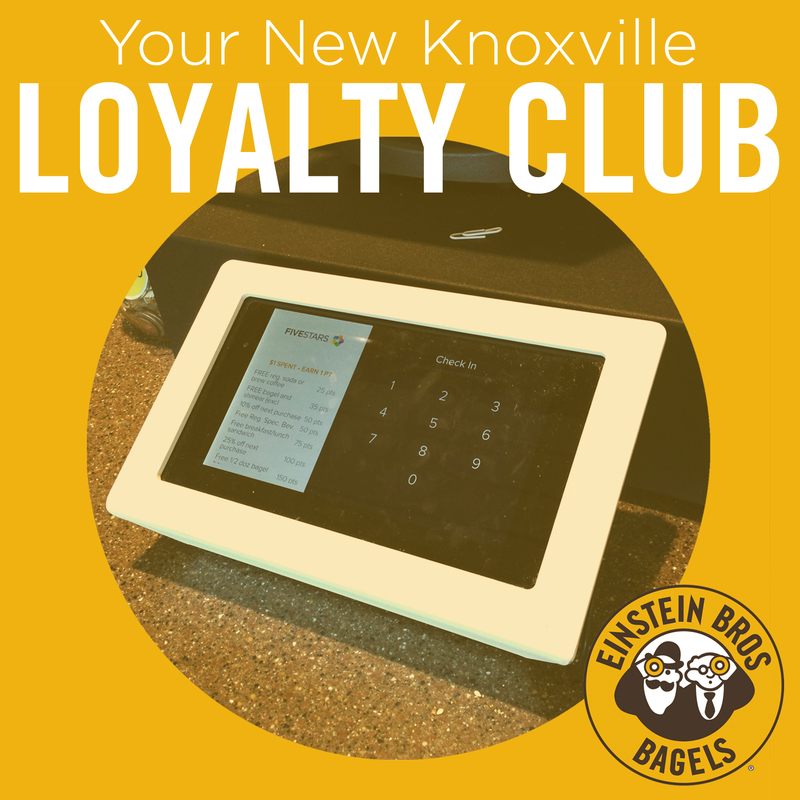 Did you have a 5 Star Experience at our local Einstein Bros. Bagels you’d like to share? Take a moment to review your latest meal with us on our Facebook page! And be sure to Like Us for all the latest updates, events and special offers at our restaurants. COMING SOON! Our new Bagel Toppers are sure to kick your naked bagel into overdrive, with a variety of flavors from spicy to sweet that you can mix and match for only $3.50! Keep an eye out this June for a new kind of anytime treat. We just uploaded our first commercial, filmed locally at our Farragut location and featuring some familiar faces. Check it out on Facebook! Have you tried our Santa Fe Egg Sandwich – stuffed with salsa, sausage and pepper jack cheese? Or the Green Chile Club Sandwich – pilled high with roasted turkey and bacon on a gourmet green chile bagel? Now you can try both for HALF OFF on Tuesday, May 5 to kick off your Cinco de Mayo celebration right! Have you gotten Mom her favorite things? Start Mother’s Day off right with her favorite bagels! Place your Bagel Bucket pre-order by Saturday, May 9 and receive a FREE cup of coffee when you pick them up on Sunday! Cater your latest tailgate party with us! Call 675-NOSH, and mention this blog post to receive a half dozen cookies for FREE with your order! Try our Greek Yogurt for FREE! Have you tried our delicious Greek Yogurt? Compared to our regular Yogurt Fruit Parfait, it’s thicker, tangier, and comes with honey and granola. 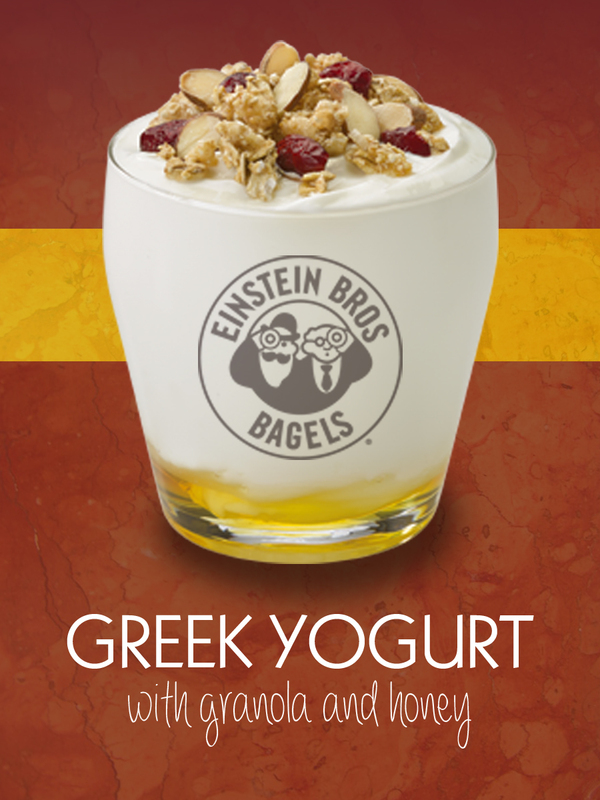 Try our Greek Yogurt today for $1 OFF, or FREE with the purchase of an Egg Sandwich! * This offer is good for the entire month of April, so don’t miss out! *One time use. Valid with purchase. Present this post for $1 off OR free with the purchase of any egg sandwich/panini. Expires 4-30-15. 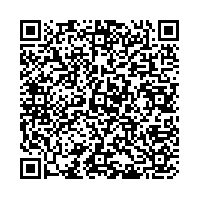 To receive the latest updates and offers, join our email club by scanning the QR code below, or stop by our Facebook page and click the “Join My List” tab on the page toolbar.